GIG21 organiser Lewis Hazel with mum Nicola. Pic: Barrie Seath. A one-off gig organised by a selfless St Andrews man has raised thousands of pounds for two mental health charities. GIG21 has raised £17, 237, at the time of writing, with donations still pouring in through a fundraising page. 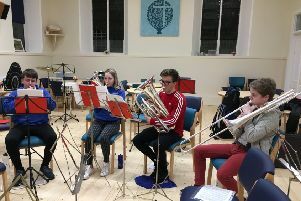 The one-off concert was organised by student Lewis Hazel, who was inspired to arrange the event after hearing about the suicides of two young men from the town. Lewis organised the event for his 21st birthday, forgoing a party for the mental health awareness gig. A host of DJs and bands performed at the event, held at Younger Hall, helping to raise funds for two charities – Touched by Suicide and Breathing Space Scotland – as well as raising awareness of the issue. A sell-out gin tasting event and charity auction, GIN21, also raised money. Lewis thanked those who had helped organise the event. if anyone wishes to continue where I finished off please get in touch I’d be happy to help. “I’m blown away by the amount we have raised,” he said. “To have raised this in a matter of months is incredible. I’m very grateful to everyone who got on board to help me and make both GIG21 and GIN21 such a success. “I’m particularly grateful to my mum, who when I first mentioned it, made every effort to make it happen and support me. “This money will go a long way to support both charities, which need funding, and thanks to them for agreeing to keep the money raised in the local community, supporting the young people of our town. If you would like to make a donation, visit www.justgiving.com/fundraising/gigtwentyone.